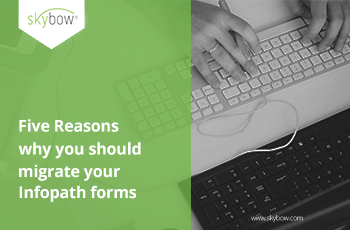 Five reasons why you need to migrate your InfoPath forms, today rather than tomorrow. Microsoft has announced that it will not develop InfoPath any further. It will extend support for current InfoPath products to 2026, but there will be no new features. There are many reasons for this decision, but the main reason is that compared to today’s technology, InfoPath is ancient. The way forms are built and how they are rendered in the browser is not up to date with any of today’s standards. Instead of fixing and patching InfoPath, Microsoft has decided that the best way forward is to abandon it. Although Microsoft is extending support for InfoPath products to 2026, this does not mean that the forms created during that time will work as expected. When development of InfoPath stops, the features will, one by one, slowly stop working, effectively turning InfoPath into abandonware and the existing InfoPath forms into a graveyard of outdated business solutions. For example, InfoPath forms containing custom code effectively stopped working in SharePoint Online (Office 365) in August 2016, turning the Office 365 platform into the largest graveyard of old InfoPath forms. September 2016 PU for SharePoint Server 2010, 2013 and 2016 effectively did the same for SharePoint on-prem installations, where, if Managed Solutions Gallery is used, InfoPath forms with code behind are no longer rendered in the browser. These two examples are the most obvious, but there are many other problems, such as not being able to publish forms from InfoPath 2013 if Outlook 2016 is installed and set as the default browser. Microsoft is not going to fix these problems. Regardless of how good a forms technology is, some kind of custom code will have to be developed in most cases to make the forms behave exactly as required. InfoPath custom code was first developed in the early 2000s, when deploying custom DLLs in Windows Global Assembly Cache was a standard procedure. In today’s world of cloud and hybrid environments and serverless computing, this simply will not and cannot work. This is exactly why Microsoft has deprecated all InfoPath forms with custom code in SharePoint Online and, if SharePoint PU 09/2016 is installed, effectively also on premises. But, without the ability to write custom code, the functionality of InfoPath reduces dramatically, turning it into a simple UI designer without any advanced features. One of the major features of each forms and business solutions platform technology is field validation and recalculation. From day one, InfoPath has had only rudimentary validation and calculation capabilities, relying on custom code for more complex validation scenarios. Now, with custom code being turned off, InfoPath has no way to perform complex fields and forms validation, or custom calculations. This reduces the usability of the forms to a minimum. Finally, for more complex scenarios, including master–detail relations and relational data, it is not possible to create InfoPath forms on top of SharePoint lists. In such scenarios, the only possibility is to create forms on top of SharePoint form libraries, where the data is stored in XML files. The problem with this approach is that the data is effectively locked in those files, making the automated transfer or migration of that data impossible. None of the standard third-party migration tools supports migration from InfoPath XML forms into any other format, which leaves the development of custom PowerShell scripts as the only option to get that data out of the forms libraries. By continuing to use the form libraries and InfoPath XML forms, more and more ‘locked’ data will be collected, making the inevitable final death of InfoPath a migration nightmare. 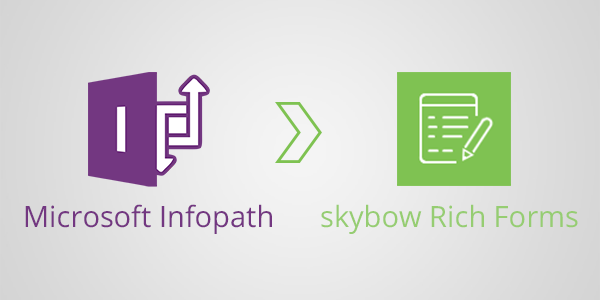 You can easy replace Infopath by using skybow Rich Forms. Click here to get a first insight in how to migrate your Infopath Forms!